Let me first tell you that we greatly enjoyed sailing on your beautiful FAUSTINA. My wife Ingrid, our daughter Nathalie, her two girl friends and me got a first class treatment. The Captain, his wife Hale and the sailor Ferat dit a perfect job. 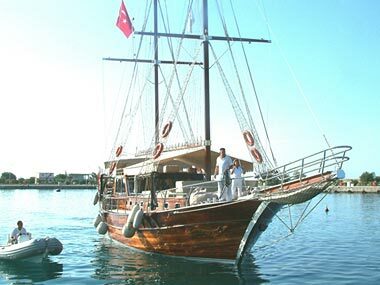 Privately owned by an Irish Gulet and sailing enthusiast, M/S FAUSTINA offers 5 star quality and comfort. She has 4 cabins for up to six guests, or when whith kids, seven or eight. There are two master-cabins and 2 single bed cabins (air-conditon all over) with ensuite bathroom with shower-cabin/jakuzzi of highest standard. M/S FAUSTINA is moored in the old Harbour in the centre of ANTALYA. Flights to Antalya are very frequent from all parts of Europe and many charter companies operate regular scheduled flights. Transfers can be arranged on request. underwater marvels from its ancient past. The final route can be at the wishes of the clients in consultation and agreement with the captain. Faustina has a very experienced crew of three. Our Captain has 30 Years experience on Charter Gulets in these waters; his wife Hale is a renowned Chef as well as a very experienced sailor. She will bring to you all the delicious dishes, the Turkish cuisine has to offer. More on food on board here. Captain Ali speaks very good English. A third crewman is also on board. The crew and boat of course are fully licensed and insured. Provisioning : Full-Board including Breakfast, Lunch, 5 o`clock Tee or Coffee, Dinner will be provided for 35,- Euro per Person / per day. All inclusive service 55,- Euro per Person / per day. The M/S FAUSTINA meets international safety regulations including life jackets, fire extinguishers and alarms.